The wonder of limited TV animation, where most of the characters are redheads and they never drawn all the webs on Spider-Man’s costume. This version of Spidey would go on to become an Internet superstar. On assignment in the Everglades, Peter Parker runs, swings, and self-propells (!) his way through the swamp in search of the Lizard. Meanwhile, Dr. Curt Connor is missing. 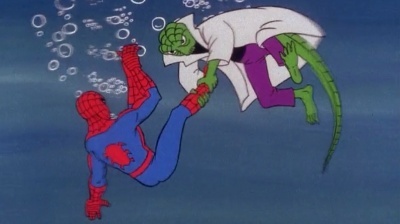 As Spider-Man, he encounters the Lizard underwater, in Dr. Connor’s Lab, and a gator-infested (use your imagination!) castle. There Spidey defeats the super-strong reptile and gives him a dose of the serum. Dr. Connor is normal again and can resume life with his wife and son. Spider-Man and the Lizard fight for the first time again! With slight new animations, rearranged scenes, and altered backgrounds that appear that Spidey’s swinging through the cosmos. Bad news! I really struggled to make ends meet back then. At least in the 60s people respected jazz! That jazzy soundtrack was the only thing the production companies put effort on! By the way, would you cut out the language on those image macros of me? Your friendly neighborhood Spider-Man needs good publicity and Aunt May can’t have another heart attack looking at the Interwebs. Thanks! NEXT: Spidey meets his Amazing arch-nemesis in 1981.